Many of you know Custom Beer Handles as the best tap handle supplier in the industry. But did you know that we design & manufacture more than just custom tap handles? Over the years, we have had the privilege to work with so many wonderful craft beverage companies including craft breweries, urban wineries, natural beverage companies, action sport brands and more. These customers have come to know us as their favorite custom signage supplier because…well, we just get it! Making an impact on your consumers at retail is vital in the beverage world. As most marketing gurus out there know, developing a robust Point of Sale program is an organic process that requires creativity, time and plenty of observation. 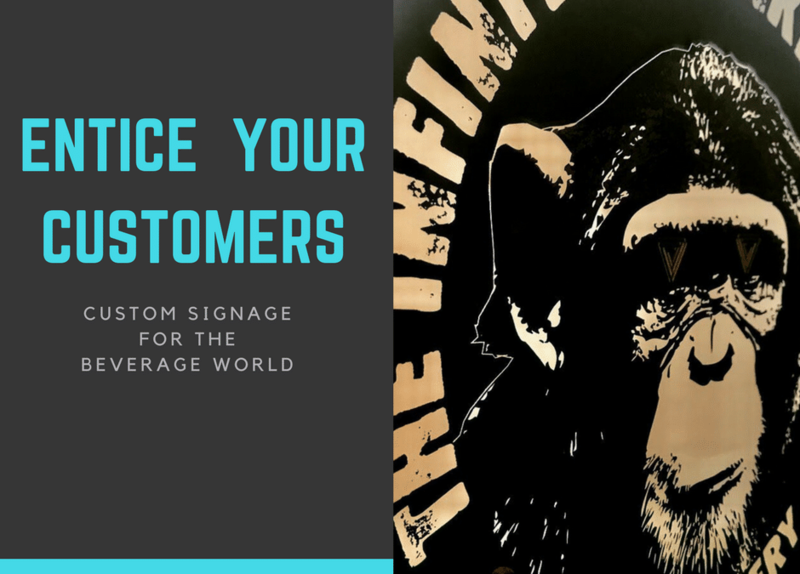 Designing custom signage for your brand(s) is a great way to test the market and see how your consumers respond. Where to begin? The Custom Beer Handles Team is here every step of the way to ensure your design is both eye catching and practical for your next campaign. Establishing a rough budget is going to set realistic expectations and your company up for success. If you are just starting out, then you should know that printed and embossed metal tackers are going to be your most cost effective signage option. These are made from aluminum material that is printed with your logo or artwork then embossed to create dimension. Holes are punched strategically to ensure your accounts and customers can easily hang the signage on most walls with a nail, screw or tack. Sizing can be as small or large as you’d like, however, we will always remind you to make sure your accounts have adequate wall space to showcase your brand. Our Production Team also likes to be as efficient as possible, which means fitting a specific quantity per metal sheet before they are cut down. The shape of your custom metal tackers can be round, square or completely custom. Did we mention that our production facilities that produce this type of signage are in the USA? This means quick turn-around time with little freight and transit time. Even embossed metal tackers lay relatively flat and are extremely easy to store and distribute. Hang them in your tap room or give them to your accounts to help drive sales. Your brand will make an impact on customers while they enjoy sipping your product bar side. More non-illuminated signage material options include other types of metal, wood and acrylic. We can even design a custom sign that incorporates multiple materials to give that mixed media effect your customers will love. Close your eyes and picture a round, rustic piece of wood with a laser cut metal overlay bolted on top. If you love an old world aesthetic, we can manufacture custom barrel head signage with your logo printed front and center. Depending on your budget and timeline, we have production facilities in the US and overseas that will get the job done right. Remember there are endless signage design options at Custom Beer Handles because custom projects are what we thrive on! Illuminated signage opens up a whole other world of creative possibility. Many brands stick to a very simple, yet elegant back lit LED acrylic sign with raised letters that create dimension. The most common sizes range from 18” to 25” wide, though we’ve certainly produced countless lit signs that are both smaller and larger. LED signs tend to be more cost effective and durable than neon signs, which have made them the more popular material choice over the past several years. On the other hand, neon signs can be very sleek and create a retro feel that craft breweries and beverage companies hope to achieve. Fortunately, we produce LEDs, neon’s as well as faux neon’s now! The Custom Beer Handle factories have a production method that allows us to achieve the look of a neon sign that provide the reliability and durability of an LED sign. Our Design Team will collaborate with you to develop a sign that fits your brand guidelines and accomplishes just enough creative flare to get you noticed. Custom signage is a wonderful way to display your brand in many different environments where consumers decide what they’re drinking and how they feel about it. Hopefully, they will love your sign just as much as your product and share it with their friends on social media. We will caution you though: Here at Custom Beer Handles, we are all about inspiring one another and it tends to be contagious. Hopefully you can utilize this knowledge in your next marketing meeting or brainstorm session. We look forward to hearing from you and working together on your newest custom signage initiative. Contact sales@custombeerhandles.com for more information on this article or questions about our products: custom tap handles, beer tap handles, custom beer signs and point of sale for craft breweries. Jessica Pezzotti founded Custom Beer Handles with a mission to change the way craft breweries & beverage companies present their brand to the world. Her desire to disrupt the industry was rooted in a passion for branding and its relation to consumerism. Headquartered in Denver, Custom Beer Handles is now a leading designer and manufacturer of custom tap handles for craft breweries, wineries, coffee, and kombucha companies. The Taps Give Back Program that launched in 2018 donates a portion of the proceeds to charities and non-profit organizations on behalf of their clients. The on-tap phenomenon is just getting started and they are revolutionizing marketing for the craft beer and beverage industry. 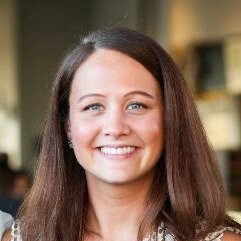 Last but not least, The Tory Burch Foundation selected Jessica as a 2018 Fellow, an elite program designed for women entrepreneurs nationwide. Cheers to that!